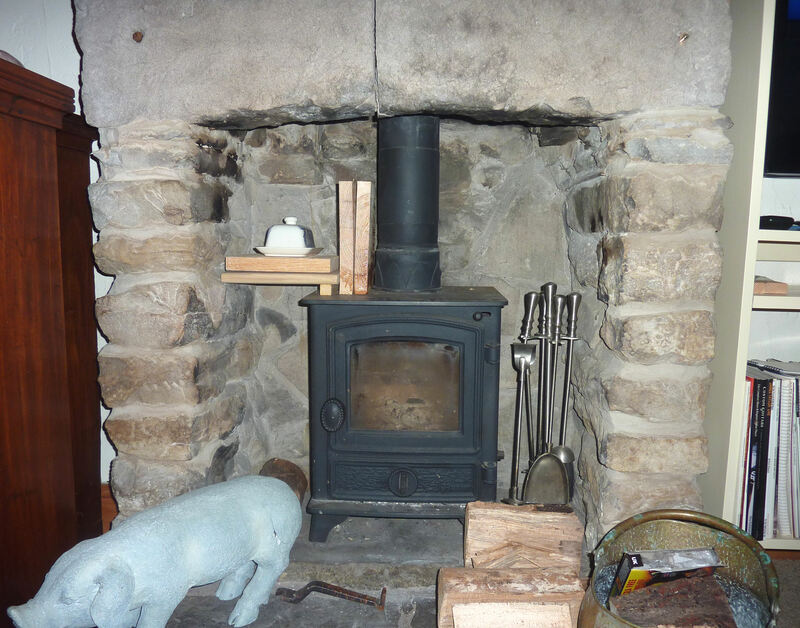 Still, today I’ve begun to take steps to make the best that I can out of what currently exists in the chimney breast, which is a cute little wood and coal burning stove with a stone fireplace. I’ve been making bread for a few weeks, but the house has been so cold that the dough has been taking many hours to rise. I know a slow rise produces a better taste but hey… I’m impatient! Today I lit the stove for the first time myself, and I was so delighted with the results that I’ve ordered a coal bunker and 5 bags of coal, and they’re due to be delivered tomorrow. Today I’ve been using logs. In the meantime I’ve made a little platform for the bowl in which I let my dough rise and the pan in which the loaves prove, and (now that the loaves are in the oven) it occurred to me that this might be a perfect place to keep my butter dish, since attempting to spread the butter on my bread has been more than a challenge, chilled, as it’s been, to near freezing point. This entry was posted on Thursday, November 17th, 2011 at 8:18 pm and is filed under New house. You can follow any responses to this entry through the RSS 2.0 feed. You can leave a response, or trackback from your own site. Ah, you have a Hunter Hawk multi-fuel – the same model as mine! Welcome to the world of woodburners. Have a look here: http://www.thegreenlivingforum.net/forum/ and in particular the ‘Woodburning’ forum. Try burning wood & coal at the same time, you get the best of both worlds that way. Ahaa, so that’s what it is! Many thanks for the link to that forum. I’ve just taken a quick look, and there seem to be a lot of people not very happy with the Hunter Hawk. What do you think of yours? I know nothing about multi-fuel stoves, but it sounds as though the forum will be a great place to gather info. Oh, and make sure you have your chimney swept once a year (or two). It makes a hell of a difference. Have you checked that it’s a stove that can burn both fuels? I only ask because it doesn’t look like one to me (but I’m just looking at a small photo). Usually stoves that can burn coal have a grate which can be shaken to make the ash drop down into an ash pan, and I don’t see a shake knob in the photo. Wood burners usually have static grates or even have the fire on the bed of the stove. Coal burning grates also tend to be a cast iron grid, whereas wood burning grates (if there is one fitted) tend to be steel or cast iron plates with holes in. Google “difference between wood burner and multi fuel” for more info. If you do start burning wood, try your best to make sure it’s as dry as possible. Store it under cover if you can, preferably with a good airflow over it, and always have a few logs drying by the stove. The difference in heat produced compared to wet logs is amazing. I have to confess that I’m a fan of burning wood. It’s nearly carbon neutral, it’s not as dirty as coal, and it comes from a friend just down the road. Our wood fired Rayburn heats the house, the water, and we cook on it. People are put off by the fuss of getting logs and emptying the ash, but simple soul that I am, I enjoy it. I’m currently planning to burn a mixture of coal and wood, because I’ve been told that I’ll go through an awful lot of wood if I solely use that. Luckily there’s a wood yard just above the village, but I think it would be expensive to rely on them alone. I’ll have a look at the fan, thanks. Sounds like a v. good idea. Incidentally, if you click on the picture it gets quite a lot bigger. On my laptop, and presumably on other computers, I can click a second time, and then it’s huge! John J’s comment hadn’t appeared when I made my comment. Sounds like you have a good stove. It’s certainly true that you will get through a large volume of wood if you just burn wood. That’s due to wood having less kwh per kg, and also being less dense; and given that you really need to keep quite a stock of it in order for it to dry it does take up a lot of space. It takes over our back yard every summer when I get the new lot in (much to the astonishment of some tourists who walk past). As for cost, that depends on how much you pay for the wood which unlike the cost of coal, oil and gas can vary enormously. And how dry it is. I have to admit, I probably end up paying more than I would if I used coal. Wow!! That loaf of bread looks good. Striking while the iron is hot, I had a coal bunker and 5 bags of coal delivered earlier this afternoon, and I’ll get some more logs over the weekend. It’s unfortunate that I have virtually no storage space for wood, and so wouldn’t be able to lay in a good stock even if I could find an inexpensive source. For now I’ll have to manage with the wood yard up the hill. I remember that Daddy used to burn huge logs on the Jotul: great horizontal slices of tree. This little stove won’t take anything as big as that, but hopefully it’ll be enough to keep me warm. I think it’s not a particularly good stove, now that JJ has identified it. Maybe I’ll change it when I have some dosh in hand. For now, though, it beats either a hot water bottle or turning on the GCH! You’d think that 1 kw of heat would feel the same whatever its source (assuming it heated the room to the same temperature), but we seem to respond better to a compact high temperature heat source than we do a diffuse low temperature heat source. Caveman-sitting-round-the-fire syndrome? The Hunter Hawk is a multi-fuel stove so you can burn both coke / coal and wood. It’s not the best stove in the world and I’m going to change mine for a Franco Belge, a much better stove – more controllable and more efficient. FYI Kate @ Rucksacks Braemar has a lot of experience with woodburners. She’s had a Hunter stoves and won’t have another. Having said that, I’ve had mine 6 years and it works – but not as well as other woodburners I’ve used. Rather than using a fan powered by a Peltier device (that generates volts from the heat from the stove) I use an old PC fan powered by a redundant plug-in mains adapter, it works well. What a great idea. I’ve got both of these items kicking around. I’ll try it. PW – looks cosy ! Also looks like you need to clean the glass – this will give you a much better view/appreciation of the fire..
You can get (expensive) stuff for the job, but I use cillit bang – the one with the green top. Wait for the stove to be cold, spray, leave a few minutes and wipe clean with either a damp cloth, or if stubborn use a plastic pan scrub. Then finish off with a scrunched up newspaper and voila ! I’ve picked up the link from JH and ordered one of those Ecofans for our stove in the house in France. It only burns logs and unfortunately doesn’t have a niche to warm dough like yours. Must say, your loaf looks excellent! 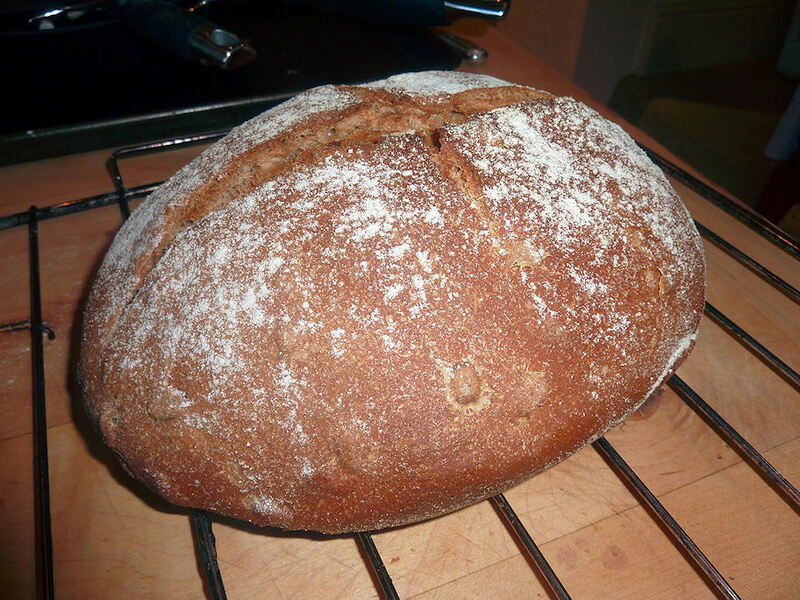 Might have to get the bread maker out this week……. I got the idea for warming dough above the stove from my neighbour, who used to be the village baker. His stove has a flat top (i.e. no inconvenient pipe rising from it as there is on mine) and that’s what he uses. He puts a baking tray on it and the bowl on top of that, to make sure the dough doesn’t get too hot. If you have a stove with any space on top then I’m sure you could use it. The loaf was nice, thanks, but not quite as good as it looks in the pic. I really enjoy making it. I made a lot before I moved, but I’ve only just started having a go here, partly because the oven’s so hopeless and almost impossible to regulate. Roll on the new range cooker I’ll be getting soon. Anyway, I’d recommend having a go by hand, unless you really don’t enjoy it. My current method is to do all the kneading actually in the bowl (I saw HMP3 doing that and it seemed a good idea). I then let it rise in the bowl (covered with a shower cap) and I only get it out of the bowl for a quick prod in order to transfer it to some sort of receptacle for proving and then baking. I only make either 1/4 or 1/2 a kilo of flour at a time, so I don’t have a huge amount of dough to knead. When I’ve mixed in the flour, yeast, salt, water and anything else I’m adding (like treacle, and/or olive oil) I retire with the bowl to a comfy position in front of the television, pop the bowl on the floor on a towel and knead away for about 20 minutes while I’m watching something interesting. It’s good fun 🙂 There are few things more satisfying than taking a home-made loaf out of the oven. I’ve been experimenting with how much liquid to add too, and I made on a few days ago that came out like a pancake. Oops… Too much water. But it still tastes great and is lovely with peanut butter. I add pumpkin and sesame seeds too, ATM. Yum!